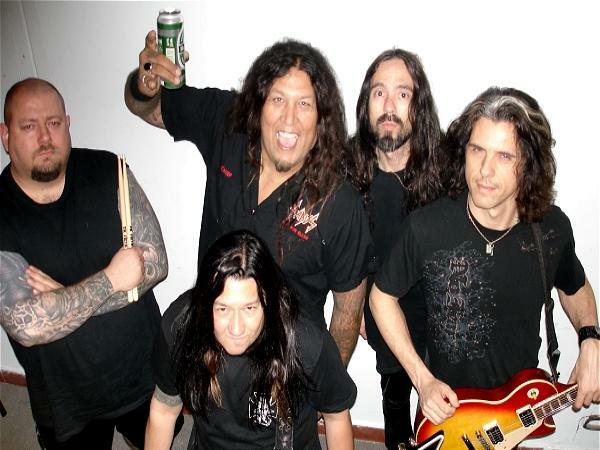 Testament is an American heavy metal band from Berkeley, California, formed in 1983. Testament has two Top 40 albums and one Top 50 album to its credit in the UK. Their most recent album, the 2008 The Formation of Damnation entered the Top 20 in Germany at #15. The 1999 album The Gathering also entered the Top 50 in Germany. They had minor top 100 album success in the United States. 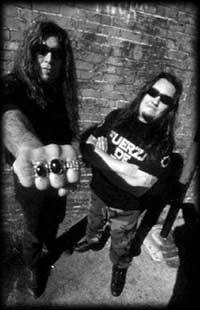 Testament was formed in the San Francisco Bay Area in 1983 by guitarist Eric Peterson and his cousin, Derrick Ramirez, also a guitarist, originally using the name Legacy. The band soon recruited bassist Greg Christian, drummer Mike Ronchette, and vocalist Steve Souza. 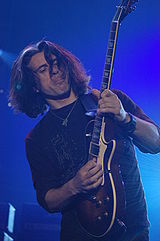 Ramirez was subsequently replaced by guitarist Alex Skolnick, who had studied under SF Bay Area guitarist Joe Satriani. The band released one self-titled 4 song demo in 1985. Ronchette left shortly after the recording and was replaced by Louie Clemente. 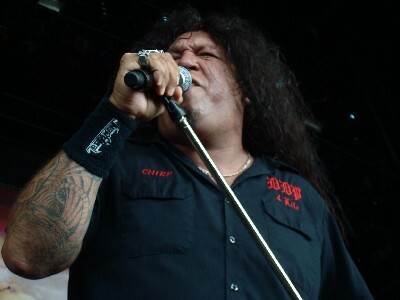 Steve Souza subsequently left the band to join Exodus, and suggested that Chuck Billy should replace him on lead vocals. 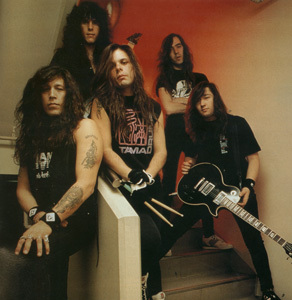 While recording their first album, the band was forced to change their name to Testament (which, according to Maria Ferrero in the May 2007 issue of Revolver, was suggested by Billy Milano of S.O.D.) because "The Legacy" was already trademarked by a jazz band. 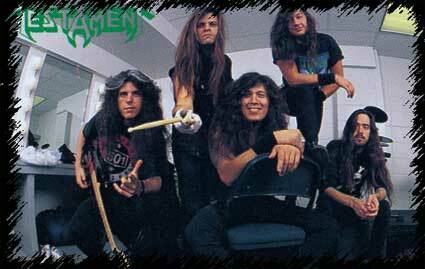 Testament's first album, The Legacy, was released in 1987 on Megaforce Records. 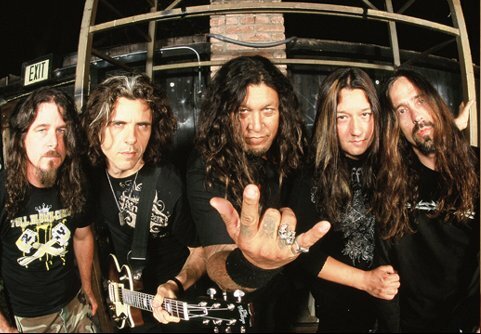 Testament received instant fame within thrash circles and were often compared with fellow Bay Area thrash pioneers Metallica. The band quickly managed to increase their exposure by heading out on a successful tour of America and Europe with Anthrax, who were then touring in support of their Among the Living album. On this tour the Live at Eindhoven EP was recorded. The next album, The New Order, was released in 1988, and found the band continuing in a similar vein. After another successful world tour the band headed back into the studio to record Practice What You Preach. Released in 1989, the album minimized the occult and gothic themes found in the lyrical content of their first two albums, instead focusing on real-life issues such as politics and corruption. The album was the band's most popular to date and even MTV took notice, giving the title track extensive airplay on Headbanger's Ball. 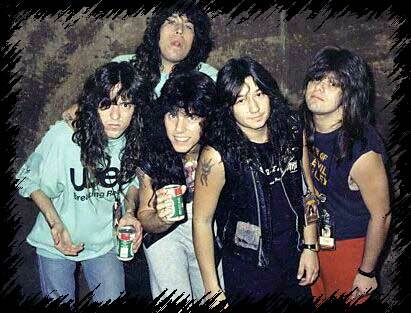 However, Testament would never be able to equal the success they found with Practice. In 1990, Souls of Black was released to mixed reviews and slow album sales. 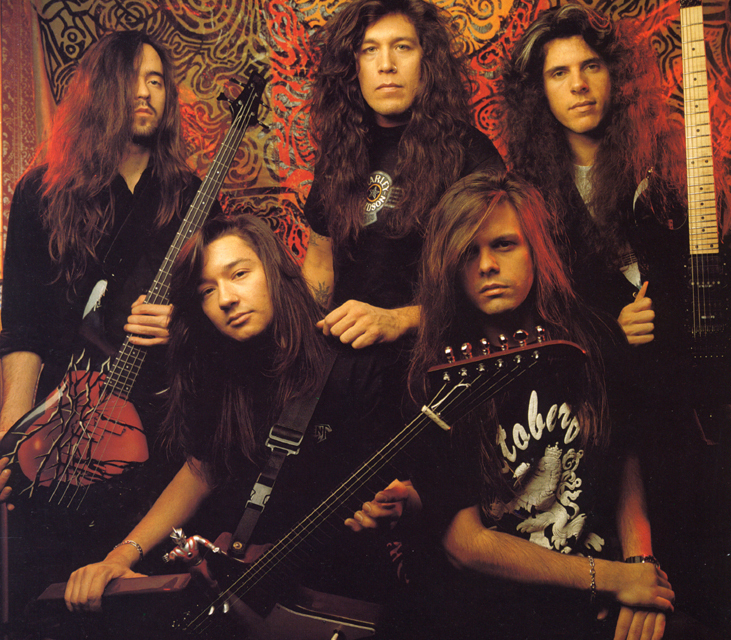 Attempting to reconnect with an audience distracted by the growing grunge movement, Testament released The Ritual in 1992. The Ritual saw a stylistic move away from thrash to a slightly more traditional heavy metal sound. Sales were poor and the band began to implode. The next decade was marked by a series of changes in the formation of the band, followed by a change of pace in its musical style. Lead guitarist Alex Skolnick and drummer Louie Clemente left. Skolnick wanted to incorporate his more melodic style of playing, but this did not fare well with Peterson, Billy, and Christian's traditional "thrashy" preferences, who agreed Skolnicks playing had become "too melodic." As a result of this clash, Skolnick left soon after The Ritual's release. 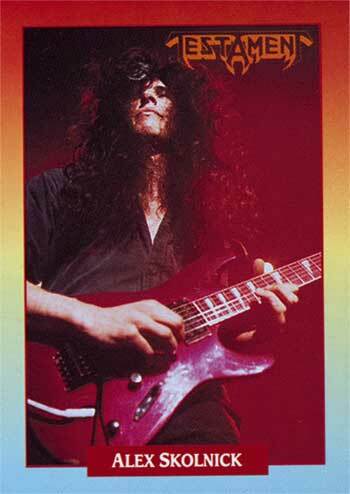 Skolnick would temporarily join Savatage, and later, would become involved with an acoustic jazz band. Drummer Louie Clemente, in the meantime, moved toward a more stable career outside of music, selling modern art and furniture. In 1993, Skolnick and Clemente were temporarily replaced by Forbidden members Glen Alvelais and Paul Bostaph, respectively. This lineup released the 1993 live EP, Return to Apocalyptic City. Soon after, Alvelais quit the band and Paul Bostaph departed to join Slayer. 1994's Low, featured John Tempesta on drums and death metal guitarist James Murphy, formerly of Death, Cancer, and Obituary. Low was a diverse album, featuring various influences such as death metal, groove metal, and as well as a ballad: "Trail of Tears". The band's remaining fans reacted favorably to Low although it did little to expand Testament's fanbase. Some fans, however, viewed Testament's move away from the mainstream as a liberation that allowed them to expand artistically, not being pressured by sales and success as they once were. Tempesta left after the recording of the album, being replaced by Jon Dette for the following tour. After their 1994-1996 tour, Greg Christian, James Murphy, and Jon Dette departed the band. Dette departed temporarily to join Slayer to replace Bostaph, also a former member of Testament. Dette's temporary replacement was Chris Kontos, who was featured on the 1996 club tour. Kontos had formerly been part of Machine Head. During the time Kontos was in Testament he suggested the band drop the name altogether and call the band "Dog Faced Gods". This idea was turned down by Billy and Peterson who wanted to continue with the Testament name. The two later temporarily disbanded Testament. 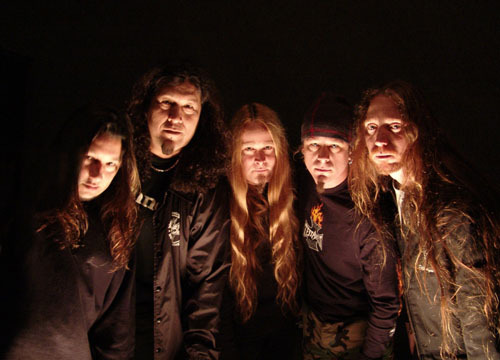 The band's follow-up album, Demonic, released in 1997, took a new approach, and found Testament experimenting with death metal more. The album featured Eric Peterson on both lead and rhythm guitar (although Glen Alvelais made a guest appearance, and played on the subsequent tour), early member Derrick Ramirez on bass guitar, and former Dark Angel drummer Gene Hoglan. Hoglan left before the tour to join Strapping Young Lad, with Jon Dette returning, once again, to tour. Hoglan's loyalty to Strapping Young Lad and his desire to not remain a member of Testament actually came to realization during a published interview the band conducted with Metal Maniacs Magazine. By 1999, Ramirez and Alvelais had departed and James Murphy had returned for the release of The Gathering. The rhythm section on The Gathering was highly respected, consisting of metal fretless bass pioneer Steve DiGiorgio (formerly of Death and Sadus) and original Slayer drummer Dave Lombardo. The sound of the album was largely a combination of death metal, thrash metal, and a minor black metal influence from Eric Peterson's side project, Dragonlord. Soon after the release of The Gathering, lead guitarist James Murphy was diagnosed with a brain tumor. Through various fundraisers, Murphy was able to afford surgery and eventually made a full recovery. Nevertheless, he now cannot recall anything from the recording of The Gathering. In 2001, Chuck Billy was also diagnosed with a type of cancer called germ cell seminoma. This kind of cancer is a rare form of testicular cancer, but it only affected Billy's lungs and heart. His cancer was also treated successfully. In August 2001, friends of Billy organized the Thrash of the Titans benefit concert, featuring seminal Bay Area thrash bands Vio-Lence, Death Angel, Exodus, Heathen, and others. The show was headlined by a Legacy reunion, featuring Steve Souza on vocals, and former guitarist Alex Skolnick, who had not played with the band since 1992 and Greg Christian. Late in 2001, Testament released First Strike Still Deadly, a collection of re-recordings (with modern studio technology) of songs from their first two albums. The album featured the lineup of Billy, Peterson, DiGiorgio, the return of Alex Skolnick on guitar and John Tempesta on drums. By 2003 Chuck Billy had completely recovered, and the band began performing live again with a new drummer, Jon Allen of Sadus. In 2004, the band changed their lineup once again for their summer festival live appearances, and Jon Allen was replaced by Paul Bostaph, returning to the band for a second stint after a decade's absence. Lead guitarist Steve Smyth also departed to join Nevermore, and was replaced by ex-Halford guitarist "Metal" Mike Chlasciak. Shortly after Steve Smyth's departure, Eric Peterson fell down a flight of stairs, breaking his leg, and was unavailable for some dates. He was temporarily replaced by Steve Smyth. 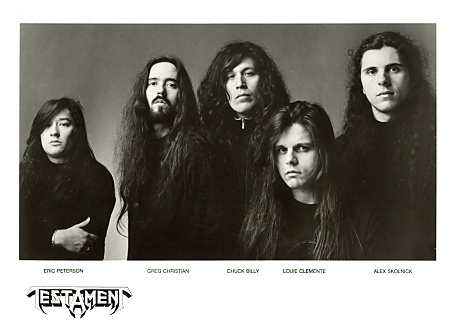 In May 2005, it was announced that Testament would be doing a brief Europe-only reunion tour - known as the "10 Days in May Tour" - featuring the original lineup of Billy, Peterson, Skolnick and Christian, with drum duties shared between John Tempesta and Louie Clemente. After the success of the initial tour dates, Testament announced more dates in the U.S., Europe and Japan with the classic lineup. Alex has also been touring the East Coast with the Trans-Siberian Orchestra. The band went on to release a live DVD and CD from the tour entitled "Live in London". In interviews on the DVD Eric Peterson expressed his desire to record the follow up to "The Gathering" with the classic Testament lineup. He also stated that Alex Skolnick had begun writing songs for the new album. Chuck Billy was very vocal about how happy he was to have Alex, Greg, Louie and John Tempesta in the band once again and hoped to maintain a stable lineup going forward. Testament played for the first time in the Middle East at the Dubai Desert Rock festival in March 2006. Other notable bands that performed for the Desert Rock Festival were Iron Maiden, Megadeth, Razed Ritual and 3 Doors Down. In July 2007, the band played a show at Jaxx Nightclub in Springfield, Virginia, with Paul Bostaph filling in on drum duties. It was later confirmed that Bostaph would be officially returning to the band to record the new album. The band debuted a new song at that show, currently entitled "The Afterlife", which they also played again at Earthshaker Fest. In February 2008, the band released the song "More Than Meets the Eye" from the new album on their MySpace page. In April 2008, Testament was confirmed for Ozzy Osbourne's Monsters of Rock festival to take place on July 26, 2008 in Calgary, Canada. 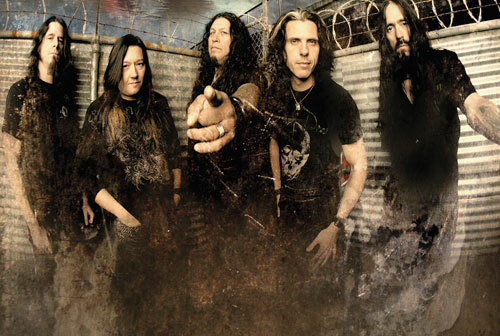 Testament released its new album, titled The Formation of Damnation, on April 29, 2008 through Nuclear Blast Records. Their first studio album in nine years, it is the first Testament album to feature Alex Skolnick on guitar since 1992's The Ritual, also the first to feature bassist Greg Christian since 1994's Low. Also, the band was confirmed to be the main event on the first day of the "Gillmanfest," a rock festival to be held on May 24, 2008, in Valencia, Venezuela. Testament will also be visiting Colombia for the second time in the band's extensive career. 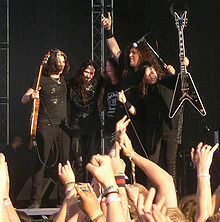 In June 2008 Testament headlined the 3rd stage at Download Festival, held at Donington Park, UK. 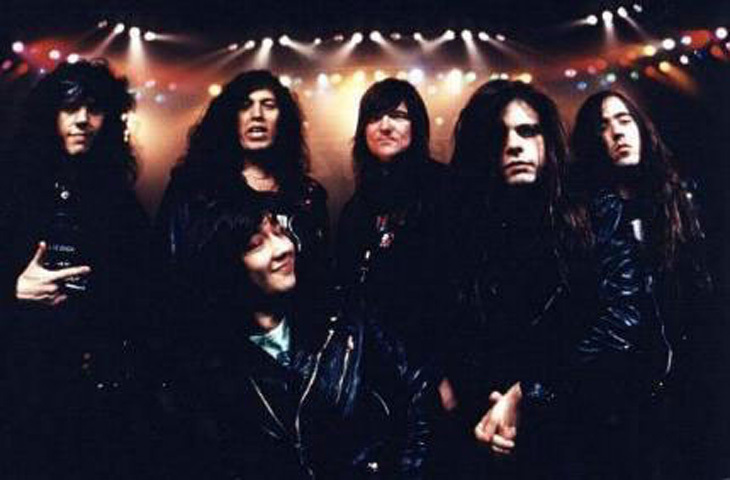 Testament also toured the U.S., as a supporting act for Judas Priest, Heaven & Hell, and Motörhead on the "Metal Masters Tour". On the 22 Oct 2008 Testament announced that they have recruited guitarist Glen Drover ex Megadeth and King Diamond to fill in on their upcoming Mexican tour dates with Judas Priest, Due to Alex Skolnick's prior commitment to the Trans-Siberian Orchestra. In late September it was announced that Testament will embark on the "Priest Feast" European tour with headliners Judas Priest and Megadeth in February and March 2009. On March 25, 2009, Testament played a special One Night Only show at the O2 Islington Academy in London, where they played the first two albums (The Legacy and The New Order) back to back with thrashcore band Sylosis in support. 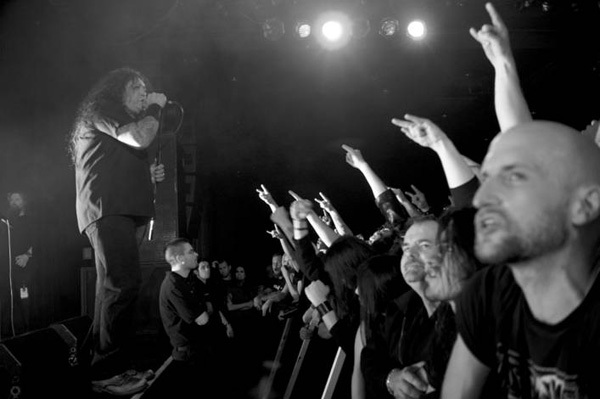 In 2009, it was announced that Testament had begun writing material for their tenth album. In an interview with Metalheadz, guitarist Eric Peterson stated that there are about four songs written and that "there's other guys in the band who like to play the more rock melodic style but the next one is gonna be a bit heavier." 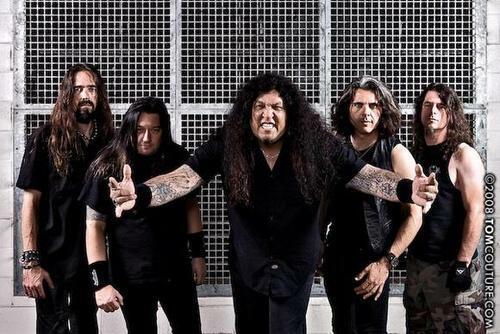 According to frontman Chuck Billy, the new Testament album will be recorded in the fall of 2010. The band is eyeing for a mid-2011 release. In 2009, Testament set out on a 6 week tour across the U.S. to promote The Formation of Damnation, touring with Unearth and Lazarus A.D.. In early 2010, Testament will tour the United States with Megadeth and Exodus. In March 2010, Glen Drover will again be playing with Testament on the upcoming Megadeth, Testament, Exodus tour In the US and Canada, due to Alex Skolnick being away again during this time. In August, Testament is touring Australia. Testament are set to play the Download Festival in 2011 as well as other U.K. dates at the Southend Cliffs Pavillion and the London HMV Forum.